Kickdrum, MBrane, Cl HiHat, Op HiHat, Clap, Rim Shot, Crash, Ride, X Sample 1, X Sample 2, FM Synth. - Real analog Jomox Kick. - Genuine analog Jomox MBrane voice with 2-linkable F-OSC for complex analogue snare, percussion and tom sounds from 16Hz to 20kHz. - 2 sample-based instruments with analog VCA envelope and / or HH filter, plus metal noise as a signal source. The HH filter is 2-pole, HP / LP / Res for each parameter, variable but not oscillating. - 4 sample-based instruments with analog VCA envelope and / or resonant multimode filter (LP, HP, BP) with ADSR envelope, plus metal noise as a signal source. The multimode filter can also be used as a signal generator to generate analog toms or sticks. - 2 sample-based instruments with external sampling input and pure digital playback. - 1 FM Synth with 4 operators and max. 6 voices for percussive sounds. - Effects Delay, reverb with send po instrument, also loopable in analogue signal path with CH, OH, Clp, Rim, Ride. - LFOs: One LFO (MBrane 2 LFOs) can be assigned to each instrument with 64 waveforms, each on pitch, VCA, Fil Cut. - 250 samples 16 bit / 48kHz in the internal flash. - SD card slot for loading samples. - Midi In, Midi Out, Midi Thru. - DIN Sync 2x in jacks Midi Out or Midi Thru. - Inputs: Stereo In for Sampling, FX, Sidechain. Both inputs are Hi-Z for guitar / bass and work up to line level + 20dB. - Outputs: 8 single outputs balanced, stereo mix balanced, headphone. - Output level: max. Approx. + 12dBu unbalanced, + 18dBu balanced at all outputs. - Input Volume analog potentiometer. - Phones Volume analog potentiometer. - Mix Volume analog potentiometer. - LCD Display 2x 24 Characters. - 12V 2A DC external power supply. - Wooden sides, rubber feet. - Dimensions 410mm x 240mm x 80mm (rear). nice to see FM in there. i wonder how it's implemented. the Mbrane drum voice is really great. curious how the OS is in this. the work flow for jomox stuff can be vexing sometimes but powerful. where's the sequencer info at? Does this mean that it'll be normal, fixed length per voice as usual? It would be nice to see variable sequence length like the LXR or new drumbrute. that would be cool. i could be in to that as well. Yeah - I know that. I used to have an Xbase09 - I know a lot of folks really complained about using that... personally I found it fine. Sure, compared to the Elektron it may be a bit of a head scratcher but I don't envisage too much hassle. But ... that sound. I've missed my Xbase09 since I sold it really. i've not heard too many (any?) people complain much about the jomox sound. anyway.. i'm not complaining.. more just curious.. I'm guessing the price will be in the $1500 - $2000 range based simply on the observation that it looks to be in the same hardware/case platform as the xbase 888 and 999. Does anyone know if the actual price has been determined yet? I really like the combination of real analog kick / snare + the "your own" sampled sound ability. 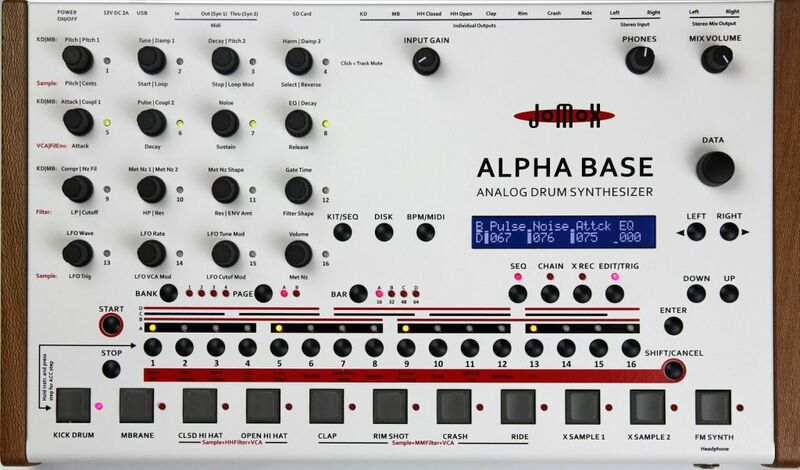 Zero mention of the sequencer on the product page leads me to believe this will have the same basic, boring Xbase sequencer. maybe he'll make a module version. that would be fun really. if the ui was pleasant. Yeah it is a bit of a shame he has released another drum machine with what looks like the sequencer and interface limitations of his previous versions, and that display is seriously antiquated when compared with the OLED displays on recent and much cheaper Euro modules. He also has a habit of releasing buggy or incomplete OS and never getting them properly resolved, and updating OS on his products is always a hassle. But I think he has the best kicks in the game by a mile. I have a 999 which I'm sequencing with the Drum Brute. looks cool. Kinda weird how they call it an analog drum synthesizer when its mostly sample based? I mean Jomox is Jomox, the sound is a known quantity. Why be cheesy like that? I've always wanted a Jomox drum machine. So many times I've played shows and asked another act 'what was that sound!' and it was a Jomox drum machine. How is that? I really like the look of the DB sequencer and have a 999.. Does velocity work well? Would definitely like to a see a rack Alpha Base too. Some time ago, I'd probably have been all over this. Had an XBase09 as a long term loan and loved the sound of it, but was always missing a few voices. When I returned it, I bought an Airbase99 as a replacement. Made me realize how much I prefer sequencing these sounds from Ableton/Max (especially Euclidean sequencers and weird logic patches), Reaktor (Maschine Sequencer Block, so much fun to play from the hardware), Patterning on the iPad (insanely inspiring), and of course the modular (via the computer). Yes, all of these require a more complicated setup, but once you get that out of the way the fun/headache ratio is much greater than with the Jomox sequencer. Do you really think it will cost more than 1200$ ? I'd like to give Mr. Michaelis the benefit of doubt on this one, but I've owned an 888 on two occasions in the past, and ended up selling them because of the buggy OS. Sound was great though. I love Jomox. Jurgen has been around so long and does things his own way which I find inspiring. I had an X-Base 09 and was thinking of switching it for a 888/999. I ended up buying an Airbase 99 when I bought Cirklon. The sound combined with excellent midi implementation and the two LFOs (when controlled by a sequencer not developed by Jomox) means it is the best "drum machine" I have used. If the sound of this is sufficiently different from the older versions, I might be tempted but would prefer a 1U version with the firmware from the Airbase. From the front panel, this sequencer appears to have four bar patterns, roll/flam and a chain mode, any of which would be a huge improvement over the 888/999. From the audio demos however, it sounds suspiciously like it's missing some of the enormous heft and grit that the 999 is famous for. Let's wait and see what the OS is. It can't be less intuitive than Elektron, which I'm happy to put up with because the sound is worth it. I've already begun to change my outlook on this thing. It does sound good, and has the right features. I really want this to be good.